Background/Purpose: Giant Cell Arteritis (GCA) is the most common systemic vasculitis in patient over 50 years of age. It is a medical emergency as it may lead to ischemic complications, including permanent visual loss in 20 % of untreated patients. Early diagnosis enabling a rapid initiation of treatment is of critical importance. Positive Temporal Artery Biopsy (TAB) is the gold standard test. However, a negative TAB does not rule out the disease. Encephalic high-field MRI, temporal arteries ultrasonography (US) or fluorescein and indocyanine green angiogram (FA) have been widely studied as diagnostic tests. However, there is currently no consensus nor clearly identified algorithm for their use in a current practice, either alone or in combination. Our objective was to evaluate the accuracy and potential diagnostic value of a multi–modal imaging combination of encephalic high-field (3T) MRI, ultrasonography and fluorescein and indocyanine green angiogram (FA). Methods: All patients referred for suspected GCA at our center between Dec 2014 and Mar 2016 were prospectively included in this study. The study was approved by an official external Ethical Review Board. PatientÕs informed consent was obtained upon inclusion. For each patient, encephalic 3T MRI, cervical and temporal arteries US and fluorescein and indocyanine green angiogram (FA) were performed. Subsequently, a TAB was performed. TAB-positive patients were considered cases of GCA ; TAB-negative patients files were reviewed by an expert in internal medicine using to determine (based on ACR criteria) whether they were not cases of GCA, or cases of TAB-negative GCA. Diagnostic accuracy of the combination of MRI, US and ICGA was statistically evaluated against this gold standard, first separately for each imaging modality, then using a multimodal classification tree. Results: Twenty-two patients were included in this preliminary analysis. GCA was diagnosed in 11 patients. Fourteen patients presented a partial vision loss and 7 a visual acuity < 1/10, reflecting severe disease. MRI was positive in 13/22 patients and negative in 8/22 patients. No patient with negative MRI had GCA. 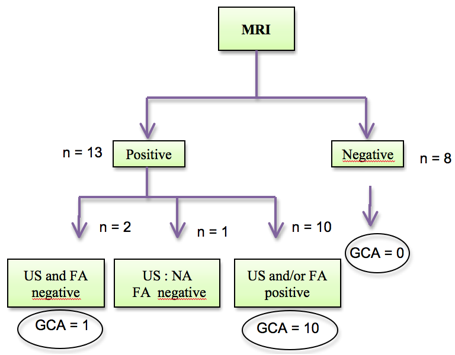 When MRI was positive, if either US and/or FA was also positive, all patients were GCA (10/13 patients) (p=0,001). If MRI was positive and both US and FA were negative, final diagnosis was undetermined (two cases, one GCA and one no GCA). Conclusion: This preliminary analysis suggests that a negative encephalic high-field MRI might be sufficient to rule out GCA, whether in cases of positive MRI the addition of the two other imaging modalities may have a good accuracy to rule-in the disease in cases at least one of them is positive. Such preliminary results have to be confirmed in the final analysis of the ongoing study. Disclosure: A. Lecler, None; S. Bidot, None; F. Charbonneau, None; S. Derrien, None; H. Picard, None; G. Clavel, None. Lecler A, Bidot S, Charbonneau F, Derrien S, Picard H, Clavel G. Preliminary Results of a Multi Modal Imaging Study Suggests a Better Accuracy for the Diagnosis of Giant Cell Arteritis [abstract]. Arthritis Rheumatol. 2016; 68 (suppl 10). 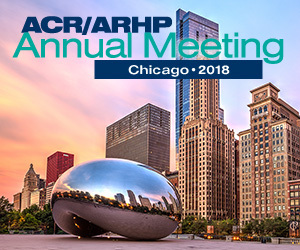 https://acrabstracts.org/abstract/preliminary-results-of-a-multi-modal-imaging-study-suggests-a-better-accuracy-for-the-diagnosis-of-giant-cell-arteritis/. Accessed April 23, 2019.